Rishank Devadiga created the record for most points scored by a raider ever in a Pro Kabaddi League match. Rishank Devadiga wrote his name in history books by scoring 28 points as UP Yoddha hammered Jaipur Pink Panthers 53-32 in a Pro Kabaddi League match, on Thursday. Devadiga created the record for most points scored by a raider ever in a Pro Kabaddi League match. UP Yoddha also recorded the highest number of points scored by any team in Vivo Pro Kabaddi Season 5. From the first minute, UP Yoddha dominated proceedings and were relentless throughout the match. 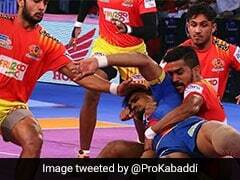 It was Jaipur Pink Panthers' Navneet Gautam's last match in Pro Kabaddi League and it ended on a sour note. Gautam, who captained his team on the night, couldn't get on the score sheet. Tushar Patil scored eight points for Jaipur Pink Panthers.